Guwahati, Feb 10: It was an emotional affair as the members of 'Firingoti' unit got together at the ongoing 4th CineASA Guwahati International film festival on Friday evening. 'Firingoti' one of the masterpieces created by celebrated Assamese filmmaker Jahnu Barua was screened at the festival to mark the occasion of his 30th year in the filmmaking. “We missed Bhaitee da (Shailadhar Barua) most. He was very dear to all of us and used to take utmost care,” remembered Chetana Das, a popular actor of the state who was also involved with the film. Shailadhar Baruah was one of the top producers of the state who gave a number of critically acclaimed films many of which have won national as well as international awards including 'Firingoti'. He passed away on January 10 in 2010. She also wished all success for Jahnu Barua. “Had he been present here on the occasion, we would have felt happier,” she said. Barua who is in Mumbai at present also expressed his gratitude for the organizers and wished his colleagues of the film good luck. “I wish I were there among all of them. I thank CineASA for this honour. Moloya Goswami got the best actress award in the film which never happened in Assamese films again,” he told Seven Sisters Post over telephone from Mumbai. 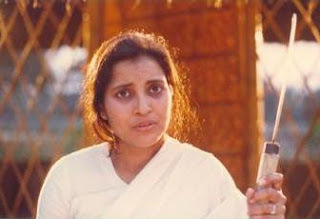 'Firingoti' which was released in the year 1992 earned two national awards for best actress and second best feature film. Moloya Goswami played the role of the protagonist, Ritu, a young widow who goes to a remote village to teach children. But she had to face challenges to prove that no fire would be allowed to extinguish the spark of knowledge any more. “They did a wonderful job in the film. It means that we are never in dearth of talents but people need to support us. People have to watch good films if such talented artistes were to be alive,” Barua added. Moloya Goswami who was felicitated among others during the occasion said that they never imagined that the film would bring such a name. “We just enjoyed doing our work and gave our best. It was really fun to be a part of the unit. The whole unit was very cooperative and great and I feel that's why it earned name and fame,” Goswami said. Besides, Ranjit Das, Chetena Das, Bhargab Kataki, Abinash Sharma and Fatik Barua were felicitated on the occasion. “It was really great to be a part of the film. Today I felt like going twenty years back. The whole unit was great. We sorted out the problems among ourselves, thus making life easier for us. I also have a special relation with Jahnu da,” said Ranjit Das, assistant director and editor of the film. He also mentioned about Shailadhar Baruah who took special care of the unit to get everything possible done. “Shaila da is a different sort of man. He was much more than just a producer,” he said.